Aging: It’s a topic that impacts each and every one of us. It’s the single greatest risk factor for most chronic diseases, which account for the majority of morbidity and health care expenditures in developed nations. In a recently released book, “Aging: The Longevity Dividend,” experts in the field explore the topic and concurrent research in-depth and call for aging to be brought into the limelight. This may seem like a tall order, but researchers at the Mayo Clinic Robert and Arlene Kogod Center on Aging, including James Kirkland, M.D., Ph.D., have devoted their livelihood to this very goal. 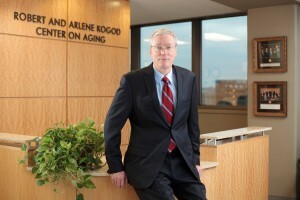 Dr. Kirkland, Director of the Center on Aging, is an editor on “Aging: The Longevity Dividend” along with S. Jay Olshansky, Ph.D., of the University of Illinois at Chicago, and George M. Martin, M.D., of the University of Washington. In a chapter titled, “Translating the Science of Aging into Therapeutic Interventions,” Dr. Kirkland addresses challenges of developing new drugs to target aging. The Center on Aging brings together basic scientists and clinicians to focus on delaying the aging process as a whole, as opposed to tackling individual age-related diseases. Recent research from the Center supports the possibility that using specific drugs to target senescent cells – cells that contribute to frailty and disease associated with age – could eliminate or delay diseases associated with aging. To learn more about age-related research, visit Mayo Clinic’s News Network.